3025 Walnut Street, Phila, PA.
CHINA COWBOY BOOK LAUNCH PARTY! 33 Central Ave | Albany, NY. Readings by Christopher Boucher, Mike Ingram, and Kim Gek Lin Short. Reading by Kim Gek Lin Short. Readings by Anthony McCann, Kim Gek Lin Short, Heidi Lynn Staples. Readings by Michelle Puckett, Cheryl Quimba, Kim Gek Lin Short, Tai Amri Spann-Wilson. 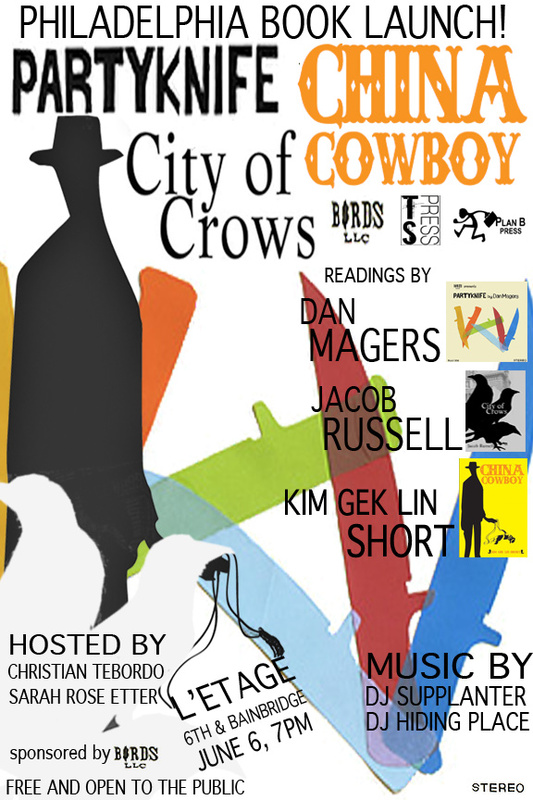 Readings by Rauan Klassnik, Justin Marks, Kim Gek Lin Short, Michelle Taransky. Readings by Debrah Morkun, Kim Gek Lin Short, Jamie Townsend. Hosted by Michael Ball. Readings by Debrah Morkun and Kim Gek Lin Short. Hosted by Tom Peters. Readings by Nicole Beer, Roxanne Carter, Debrah Morkun, Kim Gek Lin Short. Hosted by Sommer Browning and Julia Cohen. Readings by Brian Fitzpatrick, Rion Amilcar Scott, Kim Gek Lin Short. Readings by Hugh Behm-Steinberg & Reb Livingston & Kim Gek Lin Short. Readings by Ana Bozicevic, Jake Levine, Gordon Massman, Kim Gek Lin Short, and Andrew Zornoza. Readings by Patrick Lucy, Hailey Higdon, Kim Gek Lin Short, and Carlos Soto Roman. Readings by Shelly Taylor, Claire Hero, Kim Gek Lin Short, Wendy Wisner, Matthew Thorburn, James Belflower. Readings by Debrah Morkun & Kim Gek Lin Short. Readings by Jacob Russell & Benjamin Winkler & Kim Gek Lin Short. A special WOMEN WHO WRITE edition of WineO! Readings by Jenn McCreary, Kim Gek Lin Short, and Mecca Jamilah Sullivan. Readings by Carlos Soto Roman & Kim Gek Lin Short. Performance by Beth Nixon & puppets. Readings on Friday night 7pm at the Inn at Manchester by Christian Peet, Elena Georgiou, Gordon Massman, Kim Gek Lin Short, Andrew Zornoza, and more. Readings by Simone Muench, Monica de la Torre, Kathleen Rooney, Gina Myers, Davis Schneiderman, Marisa Crawford, Kim Gek Lin Short, Andrew Farkas, Shelly Taylor, David Welch, Tim Jones-Yelvington, Bruce Covey and more. April 8 2010 6:30-9:00 PM | AWP Offsite | “HISTORIC FALCON” | Mercury Cafe (in the Dance Hall) | 2199 California Street | Denver, CO | Birds, LLC; Brave Men Press; Harp & Altar; Immaculate Disciples Press; Mississippi Review Poetry Series; and New Issues Press. Readings by Julia Cohen, Brian Foley, Elisa Gabbert, Kate Greenstreet, Dan Magers, Justin Marks, Linnea Ogden, Christopher Salerno, Kim Gek Lin Short, Sam Starkweather, Janaka Stucky, and Chris Tonelli. Readings by Tarpaulin Sky Press, Fact-Simile, and Sidebrow Books.